Other Thoughts: I'm writing this review because about a year ago, I ordered this drive to replace a different Patriot model which was stolen in an airport last November. In the past month, this one has gradually become less reliable when plugged in (all operating systems became less and less likely to recognize and mount it) to the point I now can't access anything on it. I rejoice for having made backups only a few days before reaching that point. The warranty mentioned on the packaging was 3 years at the time I purchased this, but per the product description today, it appears to be only 2 years now. That's not a good sign, in my book, as it indicates Lexar was either loosing money or has simply become less generous toward people who use their products. When I contacted them to say my drive had stopped working, they were unwilling to offer a refund or credit through Newegg, and said they could only ship a replacement. Unless I want nothing, I have little choice but to go through with the RMA, but I'm now going to be apprehensive of using it for anything actually important for fear of another failure like this one, which has wasted considerable time, despite not being catastrophic in my case. There's a chance this is simply bad luck, but I'd strongly recommend paying the extra few dollars for something from Samsung or Kingston if you're in the market for USB flash memory that will last, and has a warranty that is 3 or more years long. Pros: Worked OK for only 18 months. Cons: Could only get max 40 MB/s write on USB 3.0 whether with large or small files. Thank you for contacting Lexar. Your product has not yet entered the final stages due to a new labeling restriction put in place by the US government. Before anything is shipped out we have to change the labeling on all our products in order to be compliant. We anticipate this process to be complete by the end of the month, but no guarantees can be made. We are trying to label and send out products as we can for the products that have the highest demand, but I am unsure as which products stand where on the list of relabeling and replacing. I apologize for this prolonged delay. This is not acceptable from a Company such as Lexar. I will not buy any Lexar products anymore and I hope that the ones I have don't fail within the warranty period. No self-respecting Company would run a warranty department like that. They're simply giving their business away and losing repeat customers. Pros: Good price fast shipping. Lexar has good hardware replacement policy. Cons: Lexar makes good hardware, here seems an exception. (Design flaw maybe?) Lexar sent me 3 warranty replacement drives so far. All initially worked but PC failed to see the drives after few weeks use. Other Lexar, PNY and SanDisk USB drives and drives work in the same environments. I am at a loss to explain the aberration as host hardware is off the shelf Dells with W10 and or Linux. Newegg 30 day refund policy timed out. Neither Lexar nor Newegg hold interest in refunding or replacing with another model. Pros: lots of storage space in a small package . Fast on BIG file transfers . Drive is really fast. I've stored my most important files in this drive as I highly trust due to the fact that is made my Micron and those are some very reliable chips. 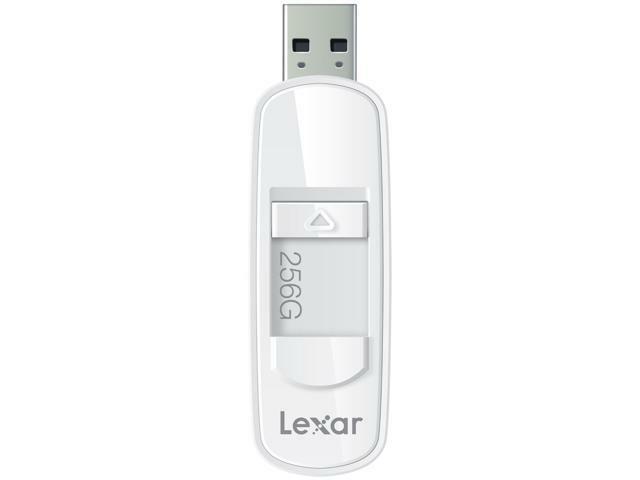 Other Thoughts: I usually buy Corsair or Kingston storage drives but this Lexar for $48 and 256GB was a great deal I had to try and I'm very pleased I did. It's very fast as you can see in the benchmark and it will definitely not disappoint. So far is at 67% capacity and have plenty left to store more files. I also bought a Lexar 64GB MicroSDXC and it's super fast as well, will go great with my new 720p camera which I will also be using on my digital camera which has a 60x optical zoom. I definitely recommend this flash drive to anyone not wanting to spend a lot of cash and sees that is fast enough for his/her needs. Pros: Bought as a combination drive backup / extra storage for laptop with 256 SSD. Works great for either. Sorry no speeds for you as I did not do any testing prior to giving it away. Cons: None that I can come up with. Pros: Fast, cheap, no lost cap. Cons: Often slips through my finders. Other Thoughts: Do not hesitate to buy it.